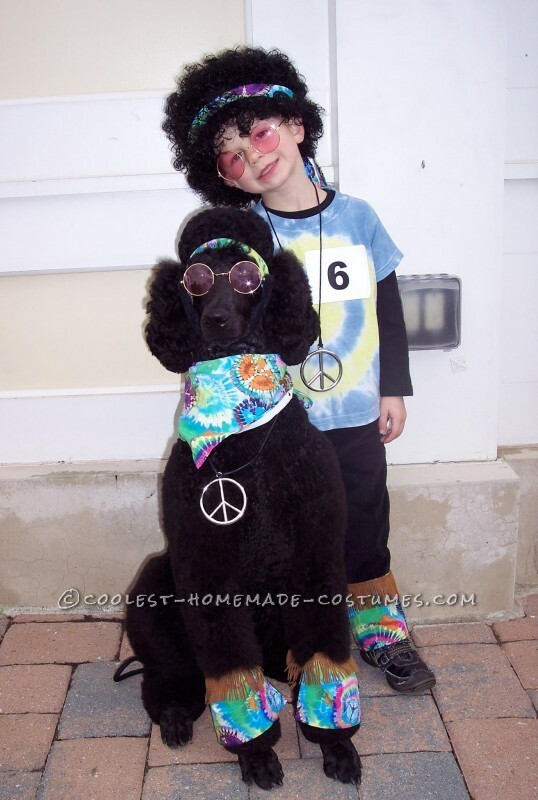 This great pet dog Halloween costume came about since our dog already comes with his own “fro.” I bought about 2 yards of tie-dyed fabric, and 1.5 yards of brown fringe. This was enough for my child’s costume as well. 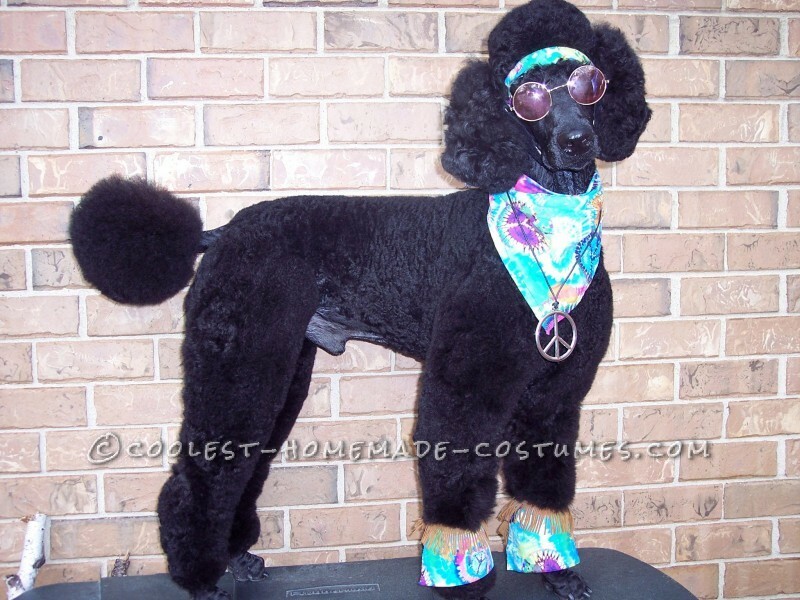 Plus hippie glasses, wig and necklaces. We already had a shirt for my child. I used a sewing machine on all edges. I would fold under edges and sew to keep from fraying. I cut a triangle out of the material for the bandana. Next I cut two separate long strips of 3-4″ wide material for the ties around their heads (measure around head and add 12-14″ so you are able to tie at the back of the head and leave some to hang down). Cut rectangles for the legs- about 4″ high, measure for length around-add 1-2″ or pre-measure the width for pants. Cut fringe that is 4″ longer than rectangles (the extra will be used to tie the rectangles at the back of the leg). 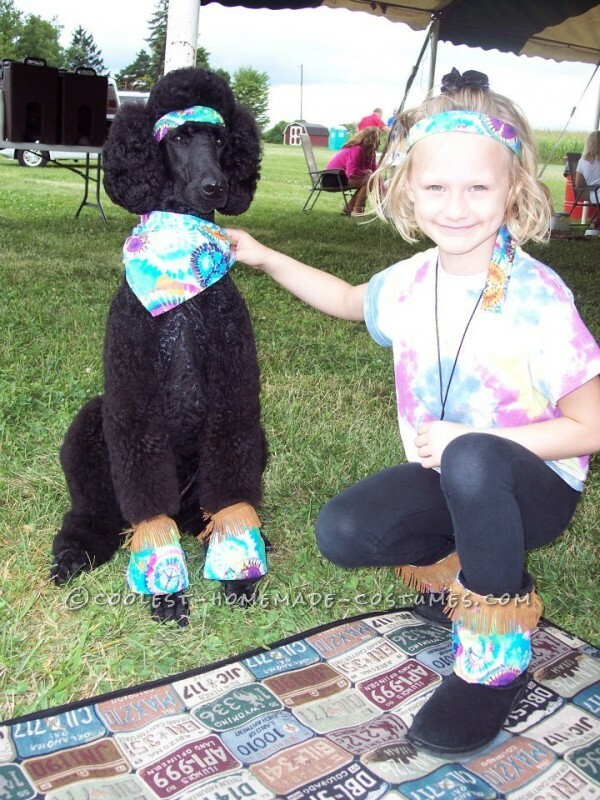 We just bought the wig and glasses for the last competition, we pulled out all the stops since there were almost 50 dogs competing, it really made the costume unique! I didn’t use any pattern, or any pictures to look a when making this, so it took about 1.5hrs total since I was making from ideas in my head. We’ve won 4 different pet costume contests with this costume, and everyone always loves it, cameras are flashing everywhere!